The retro reviews keep pouring in thanks to El Nino! Okay, maybe it's not because of that, but it sure is raining cats and dogs here where I am in the Midwest. Christmas 2015 may be a memory, but I'm still in the mood to deliver some goodness to you good boys and girls. Heck, I'll even deliver some goodness to you evil boys and girls, too. This next retro review is for a 3D platformer that I missed out on when it originally released. It's Ty the Tasmanian Tiger for the PlayStation 2, GameCube, and Xbox. That's a mad ripper, mate! My favorite genre in gaming is the platformer. Whether 2D or 3D, if done right, they feed my need for colorful worlds, tricky jump and run challenges, precision jumping, and collecting. What was once a type of game that you couldn't avoid unless you were stranded on a desert island, the platformer is pretty much only served by independent developers now. However, back in the early 2000's and many years prior to that, the 3D platformer scene was bustling, hopping, and bopping along. 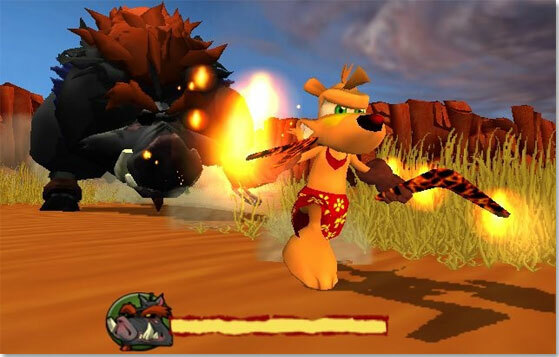 Many platforming franchises grew from that era of gaming, and one of these was Krome Studios' Ty the Tasmanian Tiger. With a wonderful personality, fun to explore worlds, and precision platforming, Ty's freshman outing is as good as a delicious bratwurst on the barbie. As a game, Ty the Tasmanian Tiger follows the foundation that Super Mario 64 and games released thereafter inspired from same have laid out. In its most distilled essence, Ty feels closer to Naughty Dog's Jak and Daxter: The Precursor Legacy more than it does Super Mario 64. For one, there is a very good sense of humor that permeates throughout the game that stretches from the computer-generated cutscenes to the banter between characters in levels. 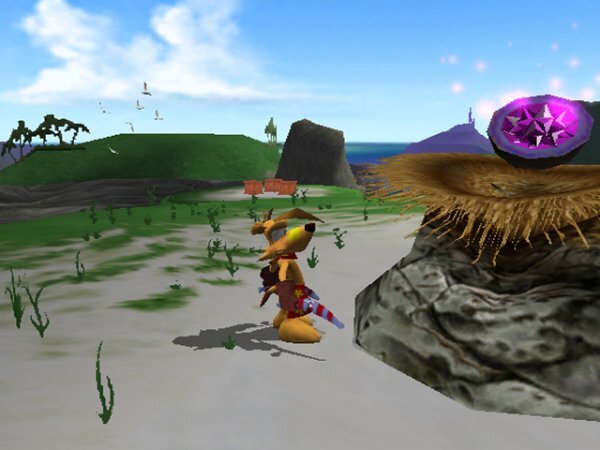 Another way Ty the Tasmanian Tiger reminds me of Jak and Daxter is that there are many smaller collectibles to gather known as opals, much like Jak had precursor orbs to nab. Finally, hitting the select button brings up a list of objectives to find and collect the Power Cell equivalent in Ty the Tasmanian Tiger. 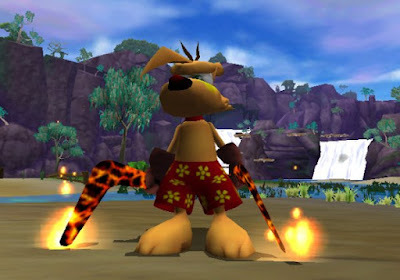 Like Jak and Daxter, this list is just a bunch of names that feature nebulous hints on what you need to do to get the main collectible, such as "Drive Me Batty" and "Quicksand Coconuts", for instance. A little rain is nothing for this Tasmanian tiger. 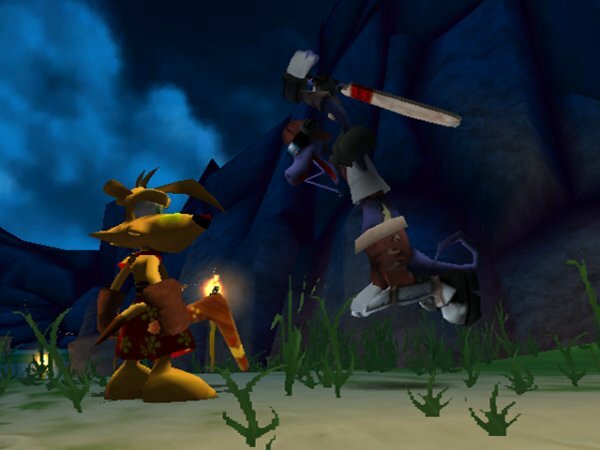 Being a 3D collect-a-thon like its inspirations, Ty the Tasmanian Tiger has plenty to venture around levels for. In the hub area of the game, Rainbow Cliffs, there are 25 rainbow scales to collect. While this is purely optional, collecting all of them doubles Ty's health gauge. In levels themselves, or at least the ones where you can explore and collect stuff, of which there are nine, the main prize (or the Jak and Daxter Power Cell or Super Mario 64 Power Star equivalent, if you will) is that of Thunder Eggs. Keep your eye on the prize, Ty-- a Thunder Egg. There are eight Thunder Eggs in the nine levels, and you get through a myriad of means. Some are as simply as coming upon them in plain sight or after a platforming challenge of some type. Others revolve around assisting NPCs with certain problems, such as emptying a cave out from the bats that inhabit it, to shooting snowballs from a stationary cannon at enemies that want nothing more than to set fire to trees. Four of the Thunder Eggs are earned through the same types of tasks in each level: collecting 300 opals, rescuing five Bilbies (think of them like the Jinjos that needed to be saved in Banjo-Kazooie), beating a race, and satisfying the requirements of the level's main quest. still aiming to catch this turkey regardless. Of those tasks, the one that really slows the game down to a crawl is searching for 300 opals. While it's completely unnecessary to gather 300 opals in every level, or even any level, for that matter, you'll want to do so for 100% completion. Opals are everywhere in levels, usually strewn about, but sometimes they'll also appear in bundles of five within boxes that can be broken. Still, it's a very tedious task to run around levels that for the most part are too large for their own good and some of which are laid out as a point A to point B affair instead of an expansive area. Having to run from one end of a level all the way to another in a point A to point B fashion gets grating after doing so for the third or fourth time. Eek! The tables have turned! With nine main levels of exploration, it's a shame that the last three of those feature borrowed assets from previous levels, a rain forest level also with its own water slide portion, a winter wonderland, and a tropical paradise. Despite this, the levels do possess their own personalities and end up being rather engaging exploring experiences. What aren't as engaging are the boss battles. Many times you'll slam your head against a wall wondering what you need to do to take down the boss in question. On many occasions you'll spend time just dodging attacks, pondering things like how do you attack the boss, when is there an opening, and the meaning of life. Okay, that last one might be just me. In any case, aimlessly trying anything to do damage to the bosses is not an enjoyable activity by any stretch of the imagination, and it's a black eye on what is an otherwise well designed game. when there's a rampaging boar behind you, Ty. Ty himself does not have a huge series of moves in his repertoire. He can run, he can jump, he can throw his trusty pair of boomerangs, and he can bite foes. 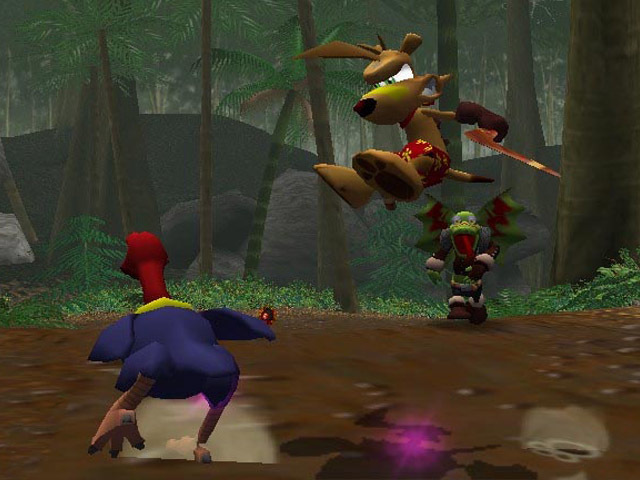 Early in the game he learns the ability to use his boomerangs to float, giving him more hang time and making him capable of performing longer jumps. Speaking of boomerangs, Ty comes across various different boomerangs that each have their own uses and potentials. Of the dozen different boomerangs to acquire, only a handful of them are story-related, meaning you can go the whole game without getting any of the bonus ones, like boomerangs that explode on contact, boomerangs that hone in on enemies, and boomerangs that can pick off foes from far away like a sniper. 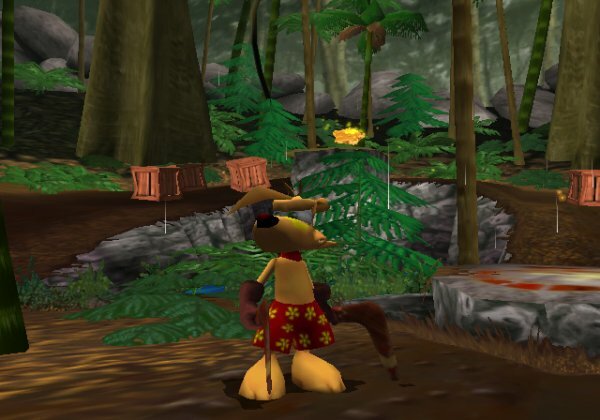 These boomerangs are acquired through trading golden cogs to a koala in the hub world of the game. 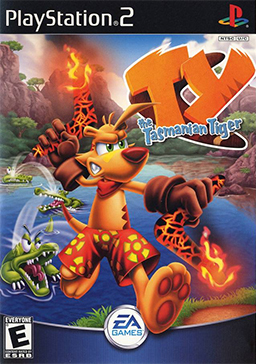 Ten golden cogs are placed in all nine regular levels, making it so Ty can go beast mode, making him have the destructive power of a Tasmanian devil instead of a Tasmanian tiger. One of about a dozen different boomerangs Ty can use. These babies are known as Flamerangs. Ty controls well enough for the types of platforming challenges required of him. The controls err more towards the side of imperfection, and by no means holds a candle to genre greats like Mario, Rayman, Banjo-Kazooie, etc. There will also be many times where the camera fusses about like a child who has eaten too much sugar. It will spin when you don't want it to, and you'll find yourself actively fighting the camera to make it turn the way you wish it to turn. While death isn't usually the result of the sometimes mediocre camera, it did result in many missed jumps, especially vexing when I'd have to redo an entire platforming sequence because of the camera's attitude problem. Fortunately, even when death does arrive, a checkpoint (in this case, an outhouse) is never too far away. Ty the Tasmanian Tiger looks good for a game released in 2002. Worlds are colorful, impressive in size and scope (but as I said, sometimes worlds are too big for their own good), and feature plenty of detail to them, such as smaller bugs wrapping around the walls and surfaces of levels. Character models animate well, and the voice actors that breathe even more life into these characters do their jobs just fine. The music is a high point also, offering catchy and never grating themes that you can't help but to bop your head in rhythm to the music. The main thing that I'm most disappointed with Ty the Tasmanian Tiger is myself, as I slept on this enjoyable and entertaining 3D platformer for over 13 years. Now, I can't wait to try the other games in the series-- just after I hunt them down, of course. Although Ty's first outing is far from a masterful debut, it's one that makes me glad I gave the series a chance when I did. Now I ask that you, too, give Ty the Tasmanian Tiger a chance.